Structured grid packing from FINEPAC ® is an excellent choice for applications that have fouling, erosion, coking and high solids content. Finagrid installed in rigid modules stacked in successive layers can be removed, cleaned and replaced quite easily. In chemical processing, a “packed bed is a hollow tube, pipe, or other vessel that is filled with a packing material. The packing can be randomly filled with small objects like “Raschig rings or else it can be a specifically designed “structured packing. - EVERPACK SM COLUMN PACKING is the sheet metal version of the popular EVERPACKWM (wire mesh) and HYFLUX (knitted wiremesh) PACKING. Their development is apart of EVERGREEN’S continuous &comprehensive development program to improve column packing performance. We provide Sheet Metal Structured Packing which is available in specific mass transfer surface areas (sq.m/cu.m) of 250, 350, 500 and 750. 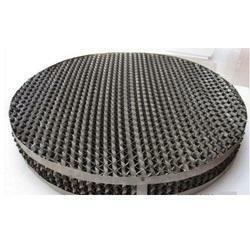 The materials used for construction are sheet metal SS 304, SS 316, SS 316L etc. This product is considered distinctively advantageous for replacement of existing column internals. Finepac offers a technically advanced product with assured performance in Process column for solvent purification by Distillation or solvent recovery by Absorption. Finepac structured packing can be employed in Extraction column too. This brilliant product is incomparable in its class. Strucured packings have the unique feature of maintaining their excelle close to their capacity limit of existing columns, including columns with conventional structred packing can therefore be successfully revamped with FLO-PAK for both an increase in performance and capacity. Structured packings is a group of elements of specified height made by stacking several crimped and corrugated sheets at an orientation of 90 degree to each element such that it provides good distribution of liquid and gases with minimum pressure drop. Finepa And Structures Pvt. Ltd.
ME-II Structured packing, is an efficient and economical products used in industry today. ME-II product has all the desirable characteristics like predictable throughput, low pressure drop, good efficiency and flexibility; which plays vital role in separations. Structured packing is one of our core abilities. Over 50 years of experience in development, design, and production of this type of packing makes us your best partner to find the optimum solution for your application. 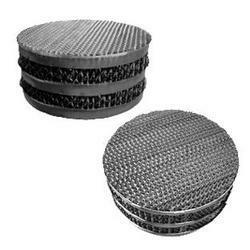 The Structured Packings provided by us are specially designed to provide for the extensive surface area to facilitate better absorption due to the larger area of contact between the phases. Our Structured Packings are designed well in accordance to the accepted standards.